The FINRA Institute at Georgetown Certified Regulatory and Compliance Professional (CRCP)® program provides compliance, legal and regulatory professionals with an in-depth understanding of the foundation, theory and practical application of securities laws and regulation. The CRCP® program is delivered through the McDonough School of Business at Georgetown University and comprises two non-consecutive weeklong residential courses, in addition to extensive pre-course readings and casework. The CRCP certificate is awarded to those who successfully complete the program within a two-year period. Past participants of the program include compliance and business professionals on a leadership track, practicing attorneys, and foreign, federal and state securities regulators. Participants in the program benefit from access to world-renowned professors and expert faculty drawn from the securities industry and regulators and build lasting professional relationships with fellow participants with diverse professional backgrounds. 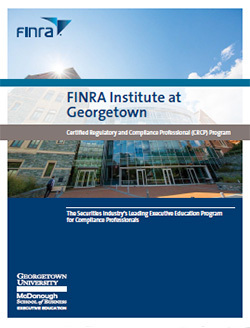 Learn more about the purpose and content of the FINRA Institute at Georgetown CRCP® program. Gain a better understanding of the FINRA CRCP® Scholarship Program and get answers to some of the top questions. Learn more about the CRCP® program and get answers to the most frequently asked questions about the program. Focuses on theory and practical application of the securities laws. Click to learn more. Focuses on advanced-level regulatory and compliance topics. Click to learn more. Click to register and read our cancellation policy. Click for Week I and Week II program costs. Click to learn more about CE requirements and eligible programs.